ELLA: It was all an accident, and I don’t accept any responsibility for what happened. Honestly though? The story can be compressed into the following: a single tweet, emails, a mere three weeks at university, phone calls, a return flight to Morocco, more emails, a manic three months of work, further communication, excitement. The End (of the beginning). 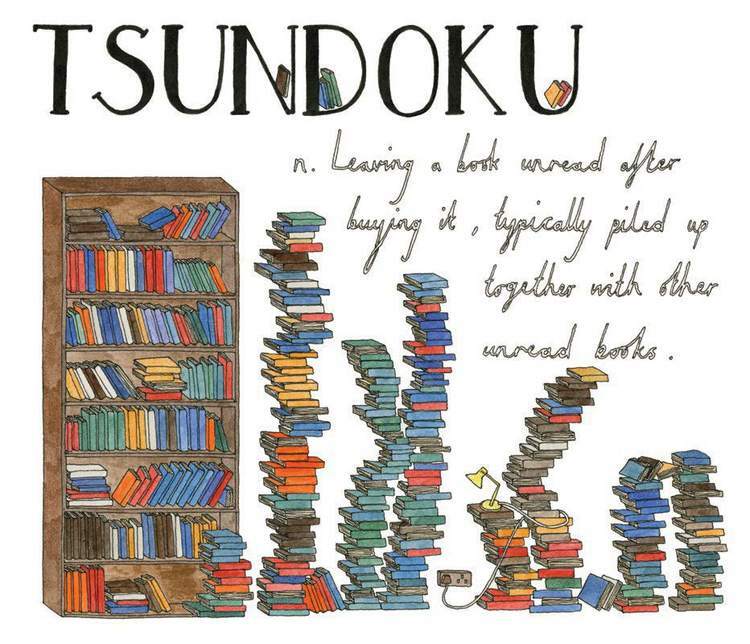 Tsundoku—Japanese | The tsundoku scale can range from just one unread book to a serious hoard, so you are most likely guilty of it. As intellectual as you may look tripping over a copy of Great Expectations on your way to the front door, those pages probably deserve to see the daylight. You mentioned that ‘having a book published is not necessarily something that life prepares you for.’ Does waking up today feel any different to waking up yesterday? Are you still feeling somewhere between chirpy and hysterical? The most unexpected thing has maybe been feeling consistently both completely unprepared, and in control, all at once. Waking up feels much the same, except I have more reasons to leap out of bed, as opposed to falling. And yes, I am still somewhere in between chirpy and hysterical... I’ll probably continue to be for some time. 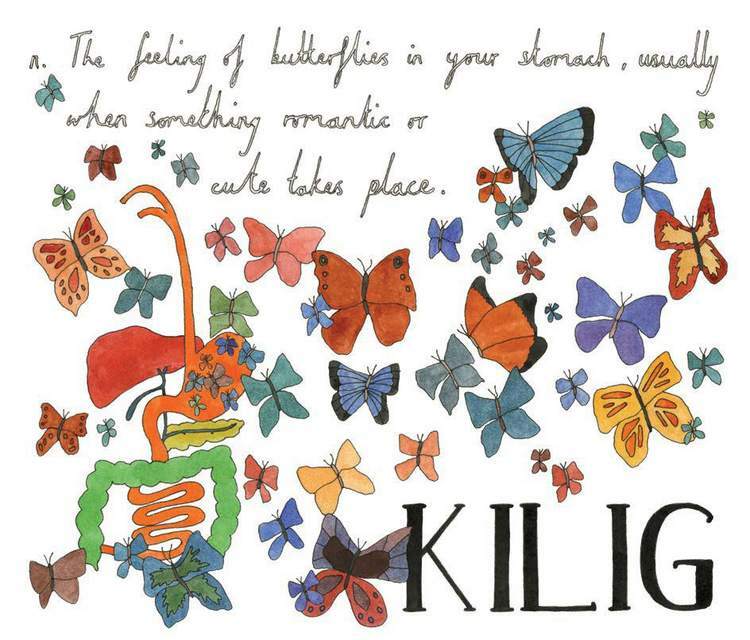 Kilig—Tagalog | You know exactly what this is. Once it has taken hold, there’s no stopping that can’t-think-straight, smiling-for-no-reason, spine-tingling feeling that starts somewhere deep inside the walls of your stomach. You recently tweeted, “Why, sometimes I’ve believed as many as six existential things before breakfast”—is there anything that you believe now that you might not have believed 400 days ago? I think that breakfasts are an ideal time to be existential, but I definitely believe more than I did 400 days ago. Things I now believe in include ridiculousness, a certain magic, serendipity, and the unbelievable. 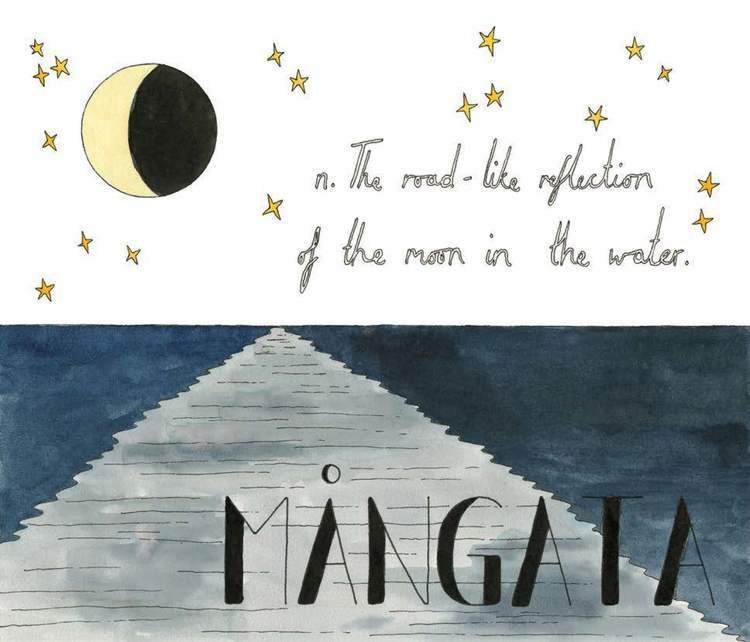 Mångata—Swedish | Perhaps people don't notice these glimmering, lyrical moments enough anymore, but the way the moon reflects and leaps across the black water of the ocean at night is surely a sight to behold. You said that you understand less than ever before, but that the world has become a thing of wild, intoxicating wizardry—what is this wizardry you speak of? This wizardry? It’s the staring-at-stars-at-3am, lying-down-in-the-rain, details-so-small-you-can-only-dream-them kind of wizardry. I think you’ll know it when it hits you. I mean, I fell over. 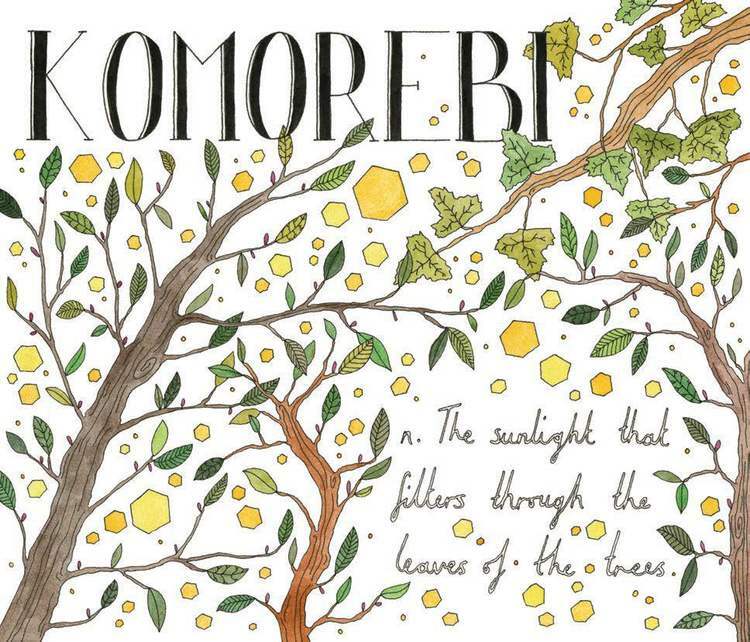 Komorebi—Japanese | It may be temporarily blinding but it’s most definitely beautiful. 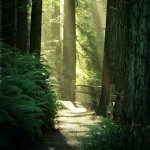 There is something wonderfully evocative and uniquely magical about sunlight filtered through green foliage. Do you have any prevailing theories as to why these particular illustrations of yours have proven so popular? Or any plans to repeat the trick in the near future? I think it’s simply that these words, although kind of untranslatable, are universal. They are genuinely interesting, and really quite intellectual if you start to look at their etemology, yet the concept is within everyone’s grasp. Or something along those lines. There are no repeat procedures planned for the near future... yet. But to be honest, isn’t ‘unintentionally viral’ quite fun? 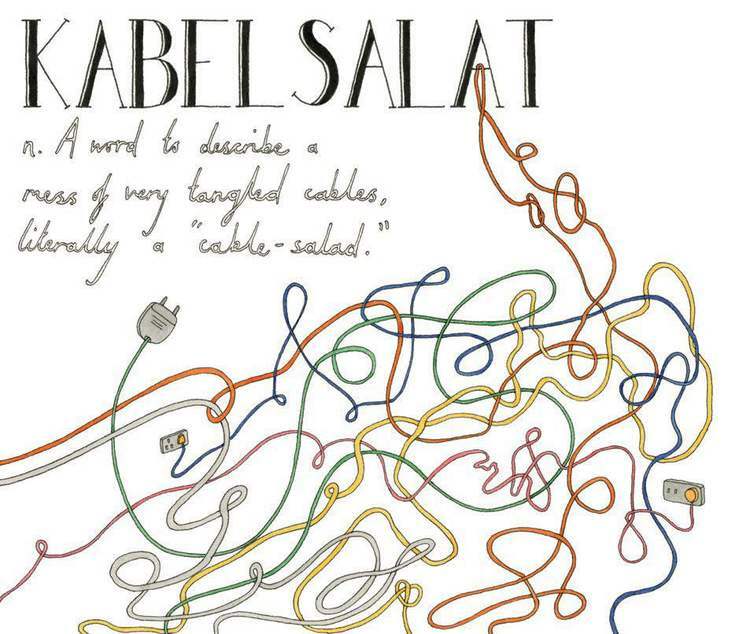 Kabelsalat—German | Cables love to tangle. Turn your back on them for one second and then you will have to spend days puting them back in order, quickly discovering whether or not you have real patience. What was your creative process like and did it change at all? During the three months of intense book creation, it was days of drawing, evenings of endorphins, and a healthy amount of what Jessica Hische calls ‘procrastiwork.’ Now? Probably much the same, just with more moving between places—I enjoyed being chained to my desk for a short while, and although I think it’s good be be close to/involved with a project, I’m someone who is often seriously afflicted with cabin fever. Trepverter—Yiddish | frustratingly, you always think of the best lines as you’re walking away. As usual, that sarcastic and biting—yet hilarious—comeback occurs to you only as you turn the corner, or have reached the bottom of the stairs. We can definitely relate to the cabin fever affliction! Other than ‘don't sneeze’ (while drawing) what advice would you give to aspiring young illustrators? Ha, that is probably my best piece of advice. Maybe I’d tell ’em to not listen to anyone quite as much as listening to themselves. The most splendid advice I found was in Keri Smith’s post on ‘ecstatic flailing’, and I don’t think I’d be able to better it—read it, or come back to me in 25 years and I might have some useful thoughts. 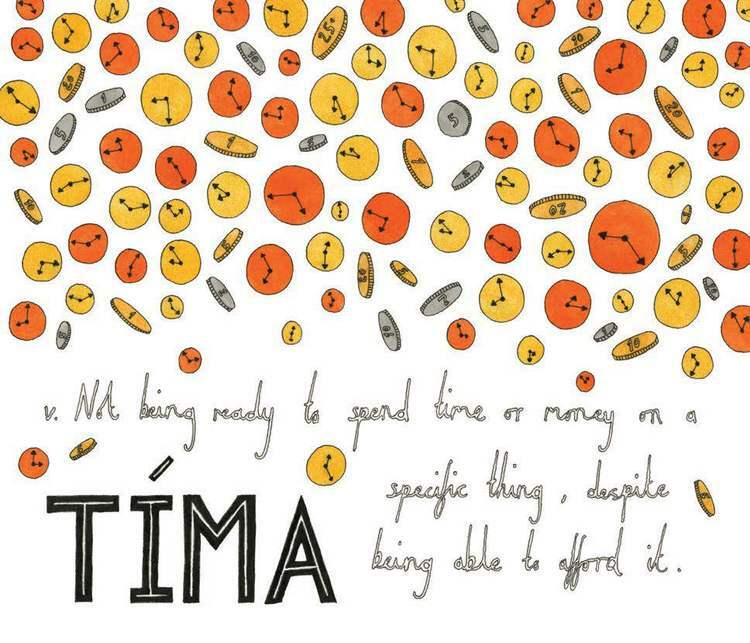 Tima—Icelandic | It can be difficult to part with things of value, such as time and money, as they aren’t infinite and they can slip through our fingers with surprising ease. We can’t get them back once we give them away, and so wanting to keep them for as long as possible is understandable. Okay, say that you just met someone in a coffee shop, which is not an unlikely scenario, and they asked about this new Lost in Translation book of yours—how would you explain it to them? I would also say that languages aren’t unchanging, though they can sometimes hold a false sense of permanence. They do evolve and occasionally die, and whether you speak a few words of one or a thousand words of many, they help to shape us—they give us the ability to voice an opinion, to express love or frustration, to change someone’s mind. 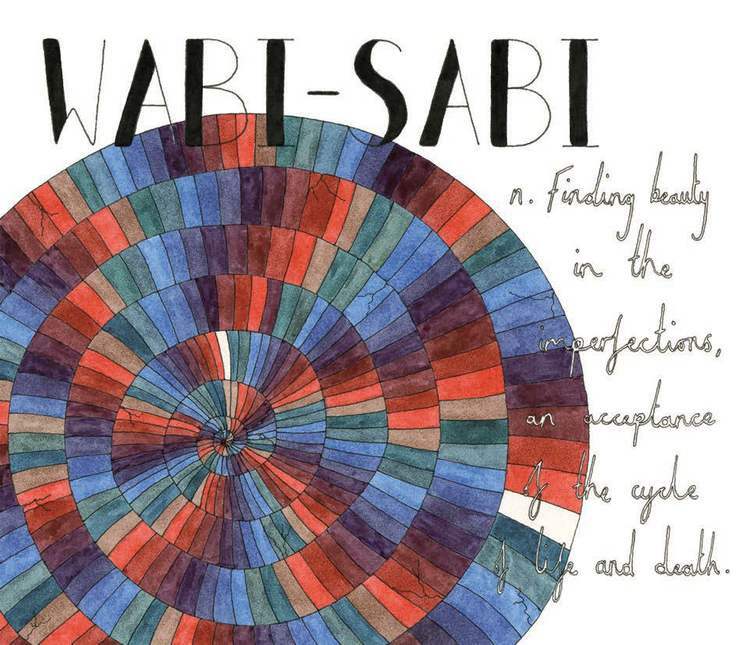 Wabi-sabi—Japanese | Derived from Buddhist teachings, this is a Japanese aesthetic centred around discovering beauty in imperfections and incompleteness. An acceptance of our transience and the asymmetry within our lives can lead to a more fulfilling yet modest existence. What has been the single kindest thing anyone has said to you about the book so far? I sent an early copy of the book to a guy I’d done a small piece of work for, and this was his reaction. I thought it was quite great, and I’m still waiting for someone to top it. 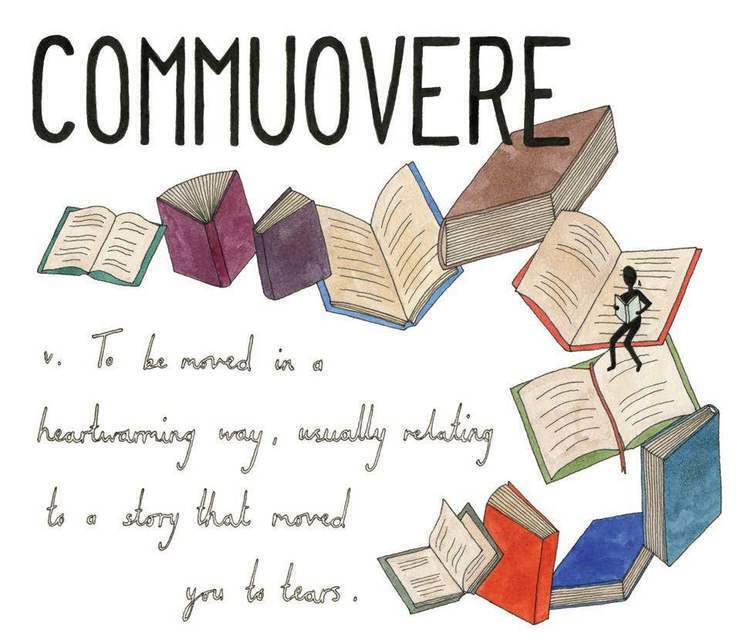 Commuovere—Italian | Maybe you had a single tear rolling down your chest or maybe you were crying for days afterward. Touching and powerful stories hit you in the most inexplicable, unexpected and undeniably human ways. Kind words indeed! Do you have a favourite illustration? Really? Oh ok, well at the moment I really like boketto and tretår—preferably at the same time. The illustration for tretår is just below, and boketto is a Japanese word which essentially means gazing vacantly into the distance, not thinking about anything in particular. 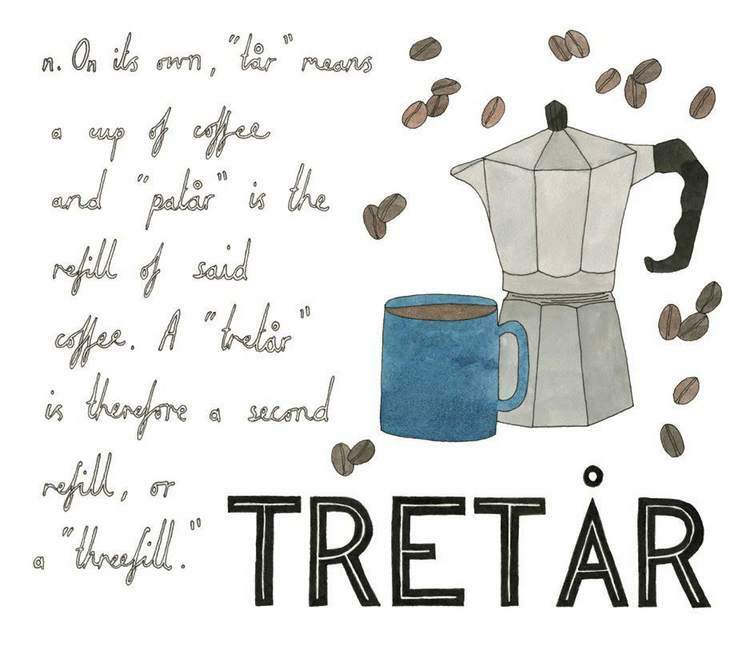 Tretår—Swedish | Whether you read this and think, “Only three cups?” or you don't understand how it's possible to stomach even one cup of coffee, let alone three, you have to admit that this is a very logical and efficient word. Do you have any plans beyond waking up tomorrow? 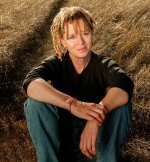 Are the days still as you delightfully put it ‘rattling with possibility?’ Are there any other book ideas floating around that you plan to create in the next 400 days? It would be quite nice to wake up the following day too. There’s plenty of possibility rattling around though, and apparently the book gods are going to let me make more, so you can expect some even more ludicrous answers by this time next year. This post originally appeared over on the Maptia Blog and is reprinted here with permission.The teamat Maptia have created a beautiful platform for telling stories about places and you can check out their "See The World" manifesto here. 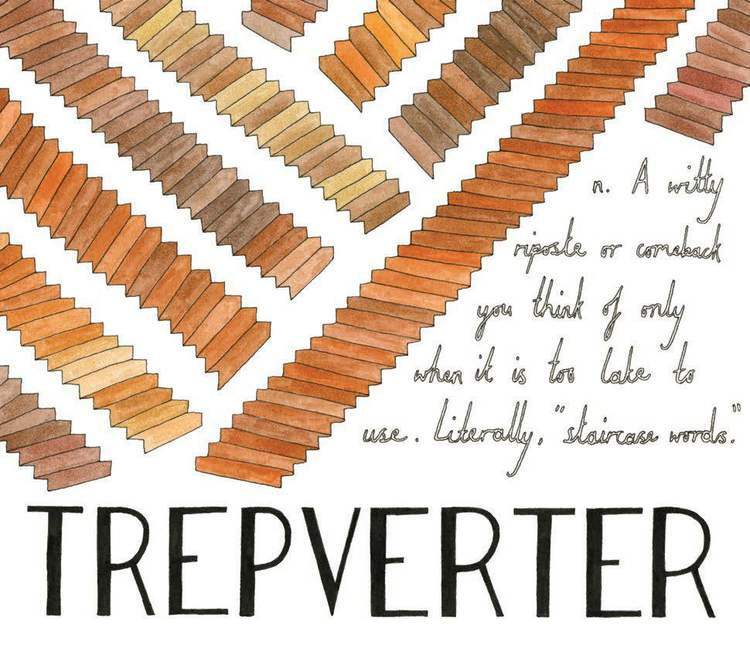 Ella Sanders' is the author/artist behind "Lost in Translation: An Illustrated Compendium of Untranslatable Words From Around the World."